Remove the middle grill(s) of your BBQ and place an aluminium drip tray on top of the Flav-R-Waves, positioned to catch drippings from the chicken. Fill this tray with an inch of water and some salt for flavour. Leave the removed grill(s) out of the BBQ while you cook. 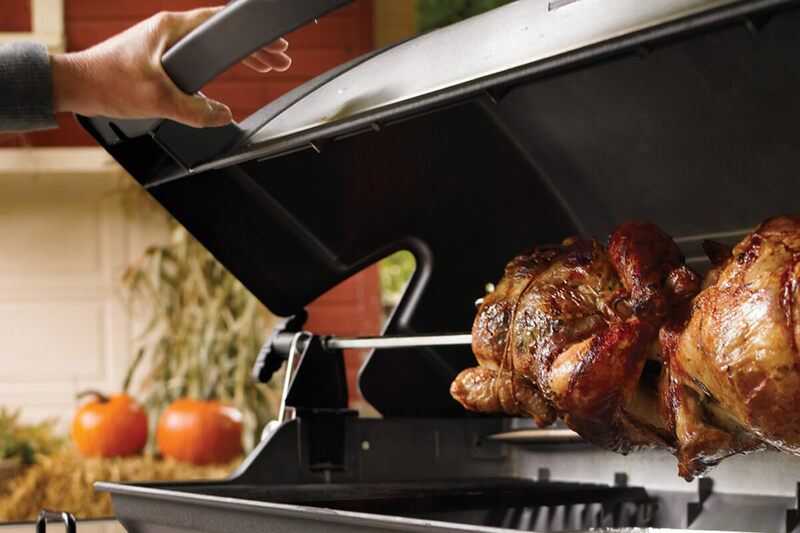 Plug in the rotisserie motor to power. Truss the chicken with string, insert it onto the rotisserie rod, and set the counterweight to balance the rotis. Place rotis in BBQ and turn the motor on. The cook time should be roughly 1 hour and 40 minutes, but the most important factor is the internal temperature of the bird. Use the Broil King Digital Thermometer to test this, by inserting it into the chicken’s breast meat. When it reads 170°F or 77°C the chicken is cooked perfectly. Remove the rotisserie from the BBQ using heat proof gloves, then unscrew one rotisserie fork to allow the chicken to slide off. Let the meat rest for ten minutes. Once chicken has cooled, carve and serve.